Attorney General Alberto Gonzales will help design procedures for the program. WASHINGTON -- President Bush signed a new law yesterday that expands the government's power to wiretap phone calls and e-mails on American soil without court oversight, capping a sudden victory for the White House despite loud criticism from advocates of civil liberties and privacy rights. Just before midnight on Saturday, Congress passed the Protect America Act of 2007, which was largely drafted by the White House and received no committee hearing. The bill carves out a broad exemption from a 1978 law that requires the government to obtain a judge's permission to monitor calls and e-mails on US soil. The new law allows the National Security Agency to spy freely on foreigners overseas when they communicate with Americans. It enables the NSA to resume a form of the once-secret warrantless wiretapping program that Bush launched after the terrorist attacks of Sept. 11, 2001, and that ended when it was brought under court oversight last January. The law also makes clear that the NSA does not need to obtain a judge's permission to monitor phone calls and e-mails if both parties are overseas, even if the communications happen to be routed through switching hubs on US soil. Such telecommunications networks did not exist in 1978, when the warrant law was originally written. In a statement issued after he signed the bill, Bush praised Congress for giving his administration the extra power he said it needs "to defeat the inten tions of our enemies" and "to prevent attacks in the future." "Today we face a dynamic threat from enemies who understand how to use modern technology against us," he said yesterday. "Our tools to deter them must also be dynamic and flexible enough to meet the challenges they pose. This law gives our intelligence professionals this greater flexibility while closing a dangerous gap in our intelligence-gathering activities that threatened to weaken our defenses." But privacy rights groups said the new law goes too far by allowing the NSA to evade warrant requirements for calls and e-mails involving Americans. They accused Democratic leaders of "spinelessness" in the face of Republican threats to blame them for any coming terrorist attack if they did not give the president the new power before leaving for their annual August recess. "We are deeply disappointed that the president's tactics of fearmongering have once again forced Congress into submission," said Anthony Romero, executive director of the American Civil Liberties Union. In two respects, the law grants the executive branch even broader warrantless wiretapping powers than the ones Bush said he had a right to exercise under his original program. First, the law requires telecommunications companies to make their facilities available for government wiretaps, and it grants them immunity from lawsuits for complying. Under the old program, such companies participated only voluntarily -- and some were sued for allegedly violating their customers' privacy. Second, Bush has said his original surveillance program was restricted to calls and e-mails involving a suspected terrorist, but the new law has no such limit. Instead, it allows executive-branch agencies to conduct oversight-free surveillance of all international calls and e-mails, including those with Americans on the line, with the sole requirement that the intelligence-gathering is "directed at a person reasonably believed to be located outside the United States." There is no requirement that either caller be a suspected terrorist, spy, or criminal. The law requires the government to delete any American's private information that it picks up, but it contains an exception allowing agents to maintain files of information about an American that has foreign intelligence value or that may be evidence of a crime. 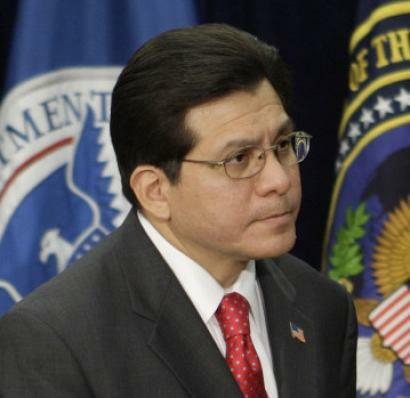 As a check against abuse, the law requires Attorney General Alberto Gonzales and Michael McConnell, director of national intelligence, to design procedures for the program and to submit them for review by a secret national security court that normally approves warrant applications for intelligence-related wiretapping on US soil. The court can reject the procedures only if it decides that the executive branch officials' plan for complying with the statute is "clearly erroneous." The program will be able to continue for a year, although the law will come up for renewal in six months. In any case, the warrantless eavesdropping can start immediately, even before the security court signs off on the procedures. The debate over surveillance dates back to the weeks after the Sept. 11 attacks, when Bush signed a secret order authorizing the NSA to wiretap Americans' international e-mails and phone calls without a court order -- even though the 1978 warrant law prohibited it. Bush asserted that his wartime powers gave him an unwritten right to bypass such a law. In January 2007, Gonzales announced that the program had been brought under the oversight of the national security court. A judge on the court had issued an unusual classified order allowing some form of the surveillance to continue. But several months ago another judge on the court ruled that the order was unlawful, shutting down some part of the program and leading to the White House push to get Congress to amend the surveillance law. The House of Representatives passed the bill late Saturday, following the Senate's approval on Friday night. In both chambers, Republicans voted overwhelmingly for the bill and were joined by enough Democrats to make a majority. It passed 60 to 28 in the Senate with 16 Democrats in favor, and 227 to 183 in the House, with 41 Democrats in favor. Legal specialists who have criticized the expansion of executive power during Bush's tenure compared the law to the Military Commissions Act of 2006, which expanded the White House's power over detainees in the war on terrorism, and the Iraq war authorization in 2002. Both times, Bush abruptly urged Congress to give him greater national security powers shortly before lawmakers went on recess, warning that there was no time to wait. That strategy was echoed in the White House's sudden rush to enact the Protect America Act last week. "The new bill shows that the Republican Party can get the Democrats to surrender almost any civil liberty -- indeed, to give the President just as much unchecked power as he might obtain under a Republican controlled Congress-- simply by playing the fear card repeatedly and without shame," wrote Yale law professor Jack Balkin on his blog. But David Rivkin, a former White House lawyer under President George H.W. Bush, said Congress had acted wisely by restoring presidents' power to wiretap foreigners overseas without warrants -- a power that had eroded because of fiberoptic networks. "The people who are engaged in scaremongering are the ones ranting about privacy," Rivkin said. Your thoughts on the new wiretapping law?